I am intrigued by the Rainbow Loom, so I have been playing around a bit. I am trying to think of some adult type things to make, but have been making bracelets since they are small. The elastic nature and decorative possibilities are endless. Anyway, I have been having fun. In knitting there are purl stitches. With rubber band fishtail looping they are a bit trickier to accomplish. There is a band between the stitch being worked and the new band being added. I found a way around it. My son thinks the stitch is too difficult for most kids. He told me the kids see the more elaborated designs and get discouraged when they can’t do it. They often don’t want to put in the time it takes to improve their skills. He thinks that is the main reason the fad for the bracelets is ending. That, and adults like me are now playing around a bit. Here are a few things I have come up with. A rose bud bracelet made with a 5 pin fishtail flowers and looped in the triangle bracelet pattern. 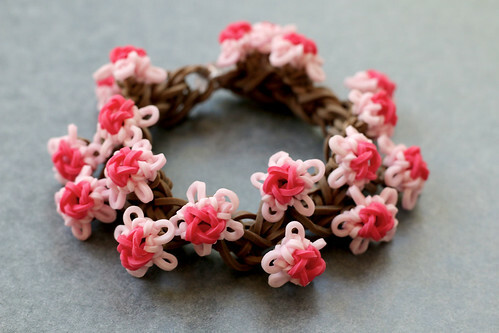 A cherry blossom bracelet made with a 5 pin fishtail flowers, including purl stitch loops, and looped in the triangle bracelet pattern. 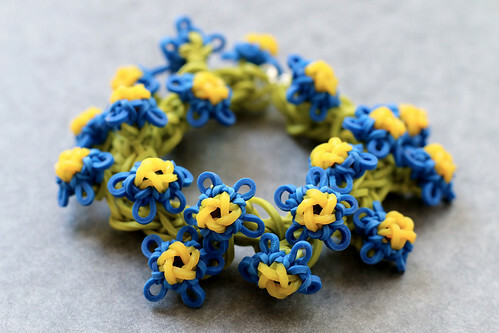 A forget-me-not bracelet made like the bracelet above. This is the one I thought of first, since the flower is perfect for friendship bracelets. I wanted to use a lighter blue, but it is too close in tone to all the greens I have and wouldn’t have stood out. I compromised by using a darker blue, and very light green. I think it works OK. 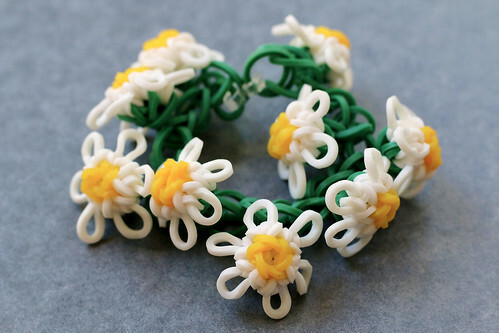 This is a daisy chain design. 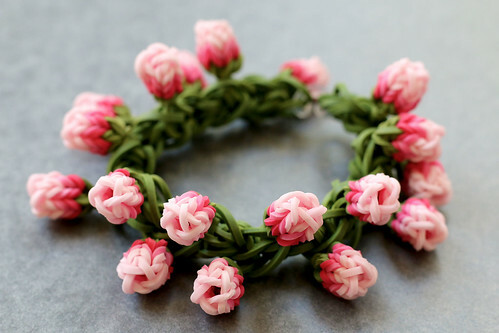 The band is a simple chain, the flowers are formed over 6 pins. 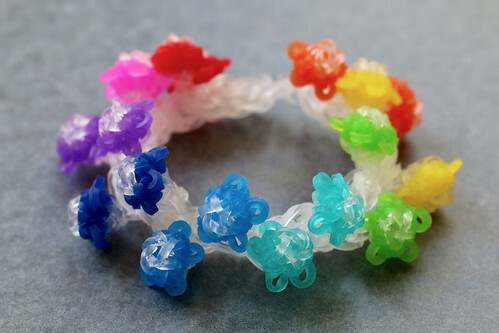 Since every design looks great using clear and rainbow jelly bands, the flowers became stars. And finally a gun drop bracelet. This is a happy accident. My son thought the bead like texture reminded him of gum drops. I have two Bruges doilies in progress. They are going to require a great deal of thought to finish. These bracelets have been a nice diversion. I think the craft could be used in some decorative home accessory way. I have lots and lots of rubber bands when I think of something. This entry was posted on Monday, May 12th, 2014 at 9:14 pm and is filed under Craft and Photography. Tagged: Bracelet, Craft, Rainbow Loom, Rubberbands. You can feed this entry. You can leave a response, or trackback from your own site. Loved all the bracelets – specially the rose bud one. 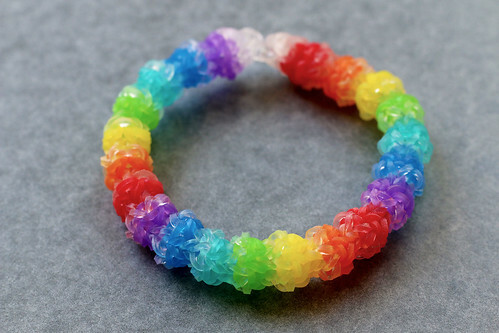 These look like such fun – and I agree with your son that the one bracelet looks like gumdrops! You’ve done a beautiful job with these. Great job! my daughter was ecstatic to see your designs…do you happen to have a tutorial video on this? Hi 🙂 , I’m a 32 yr old mom and I really love all the flower designs especially the open flower cherry and daisy. I would love to learn how you made your flowers they look extremely realistic I Love it!!! I would make a batch for my daughters and myself 😀 . 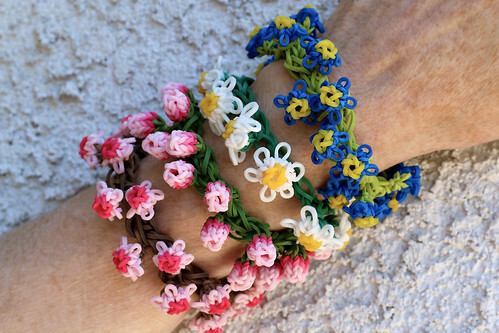 I would love to see video tutorials for the rose bud and cherry blossom bracelets. Love the bracelets :)! I too would love to see the tutorials! Your designs are amazing!!!! Thanks!! I can’t wait for playing and try to practice by your video..
i love your all “flower full” bracelets..